Since Jeff has been so busy getting the T2HS Hangouts off the ground, Dave felt he needed to make some kind of a contribution. Believe it or not, this is all he could come up with. Listener Dustin had expressed some interest in how to store his counters and, to help him out, Dave discusses his storage system. 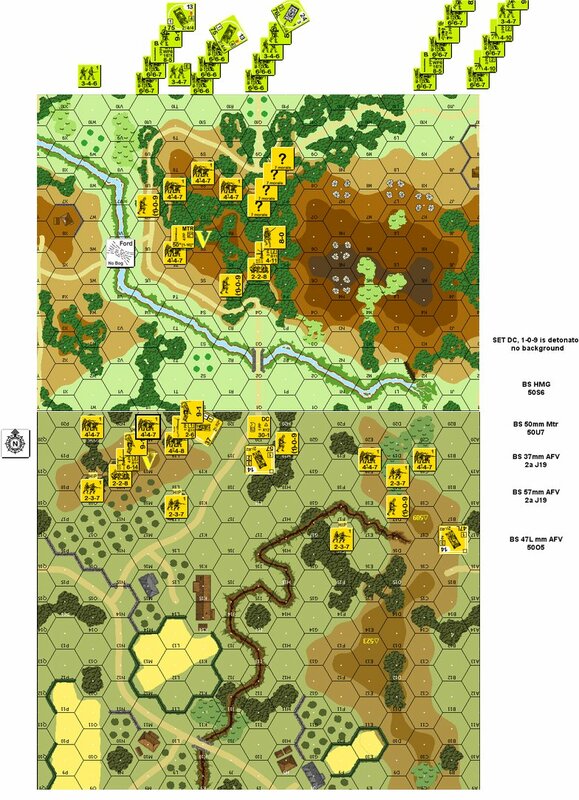 He then presents his thinking process (yes, he actually has one, in spite of what your past listening experience may have led you to believe), as he sets up a defense for a popular tournament scenario, J129 Mountain Hunters. So, this episode may not offer much to an experienced Advanced Squad Leader player, but may be very helpful to newbies. Don't forget our T2HS Auction includes On All Fronts #28, #29 and an issue called Otryad; Special Edition #1. Gmail us your bid. Items will go to the highest bidder on August 8th, 2012. We’re the Knights of the ASL table. We play when ere we’re able. We do our thing on the podcast scene, and our work is im-pec-cable. In Chicago land we play a lot. You'll hear “PaK” and “stack” and “FAQ” a lot! We’re Knights of the ASL table. Our shows, in-val-ue-able. And many times, our banter shines in ways un-for-get-able. We like to say “Sha-ZAM!” a lot. We shoot from the tree tops a looooooot. Our French accents are fable. They’re quite in-de-scribe-able. It’s busy when you play a lot. We two say "multi-man" a looooooooot. Episode 73: Now in STEREO! We know what you're thinking. The show was perfect as it was, and why tinker with perfection? Well, never ones to leave well enough alone, we started experimenting with with the capabilities of our recording equipment and lo and behold, we invented The 2 Stereophonic Half-Squads. That's Jeff in you left ear, and Dave in the right. You'll think you're right here in the Broadcast Foxhole with us in an experience so immersive you'll want to reach right out and slap us. Does this amazing leap forward in sound quality do anything for the CONTENT? Sadly, NO! We still bumble and stumble and ramble for an hour or more. But heck, it's all about Advanced Squad Leader, so how bad could it be? . . . Wait! Don't answer that! 13:00 - What Chew Been Playing Lately? Near Baguio, Luzon Island, The Philippines, April 17, 1945: It has been a little while, but we have finally posted another ASL Extra episode, for your enjoyment and edification. This one plays out SP193 KAMIKAZE GORGE from our friends at Schwerepunkt. You may learn a trick or two from our distinguished players: tournament champion Bob Holmstrom, and tournament contender Rich Domovic. 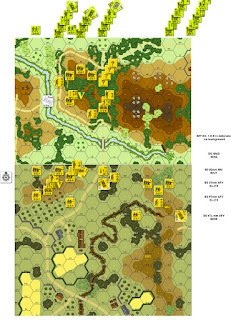 Bob's attacking Americans must clear two of three hilltop areas. Rich's Japanese will utilize all of their special abilities on the defense. This episode will not teach you the rules, but should help you see a larger, tactical view of the scenario played. It will also help you understand the greatest game in the world, Advanced Squad Leader. Fireworks are an essential ingredient in any celebration of Independence Day in the US. But you don't have to be from the USA to enjoy the art of pyrotechnics. In fact, in Advanced Squad Leader, use of the Demolition Charge -- or DC -- is employed and enjoyed by all nationalities. What's that? You're a little arsonphobic? Listen in and we'll tell you how to get comfortable handling these powerful, useful tools. First, though, we'll read some listener mail. Then Jeff has a little fireworks display of his own in a cranky tirade about . . . well, we won't say right here. Fortunately, Dave brings some peace and love back to the show by playing the final entries in our "You know you play too much Advanced Squad Leader When . . ." contest, followed with an announcement of a new contest. You'd better listen to this show. BOOM BABY!